This simple device allows two computers to share a single USB printer or some other USB device, such as an external flash drive, memory card reader or scanner. 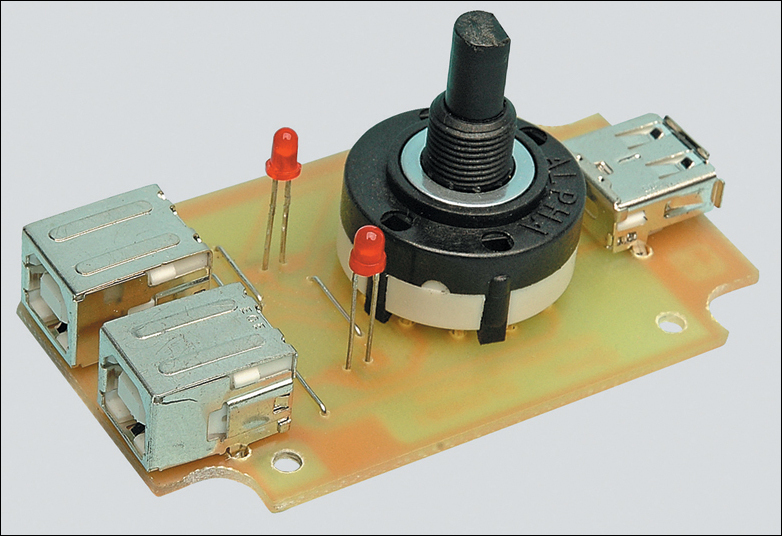 A rotary switch selects the PC that you wish to use with the USB device, while two LEDs indicate the selected PC. The most common way to share a USB printer between two PCs is to use one machine as a print server. However, that’s not always convenient because it means that the server PC must always be on if you want to print something. That can be a real nuisance if you just want to quickly fire up the other machine and print something out. It also means that the two PCs must be networked together, either via a hub/router or directly via an ethernet crossover cable. Another way is to use a dedicated USB print server. However, as before, this must be connected to an ethernet network, along with the PCs. Such devices also need their own power supply, generally cost well over $100 and are overkill if you just want to share a single USB printer between two computers for occasional printing in a home set-up. That’s where this simple device comes in. It’s basically a 2-way switch box that lets you manually switch your USB printer from one PC to the other, as required. 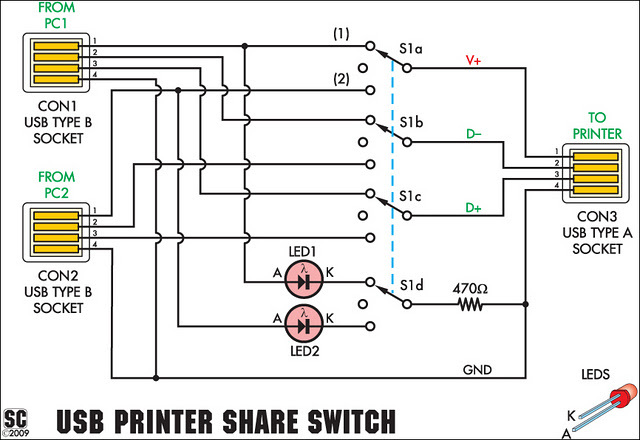 The switching is performed using a rotary switch, while two LEDs on the front panel indicate which PC has been connected to the printer. This method has several advantages. First, you don’t need to network your two computers. Second, you can print from either machine with the other turned off. And third, the device doesn’t need a power supply. 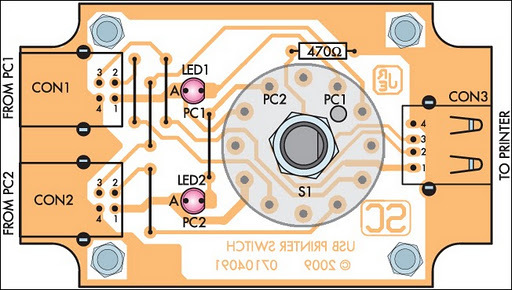 The circuit uses switch poles S1a-S1c to select either USB socket CON1 or CON2 and connect its pins through to CON3. The fourth pole (S1d) selects either LED1 or LED2, to indicate which PC has been selected.